My friend Nick came to visit last month. It was his first trip to Thailand, and in fact his first foreign holiday since he was a teenager. I always appreciate visitors, not only because it’s good to see familiar faces from home, but also because I enjoy showing them around and being reminded of what an intoxicating place this is. Indeed, to be reminded of why I chose it as my home. We hit all the usual tourist sites and did all the usual tourist things – things I rarely do anymore – and Nick was as blown away as most tourists are. He is also a writer and so has a keen vocabulary at his disposal, but his verbal reaction to the things he was seeing and doing was repetitive. The sheer size of the Reclining Buddha at Wat Pho: “Amazing”. The opulence of Wat Phra Kaew: “Amazing”. Making a muay Thai pilgrimage to Rajadamnern Stadium: “Amazing”. At Koh Chang, seeing his first tropical beach: “Amazing”. 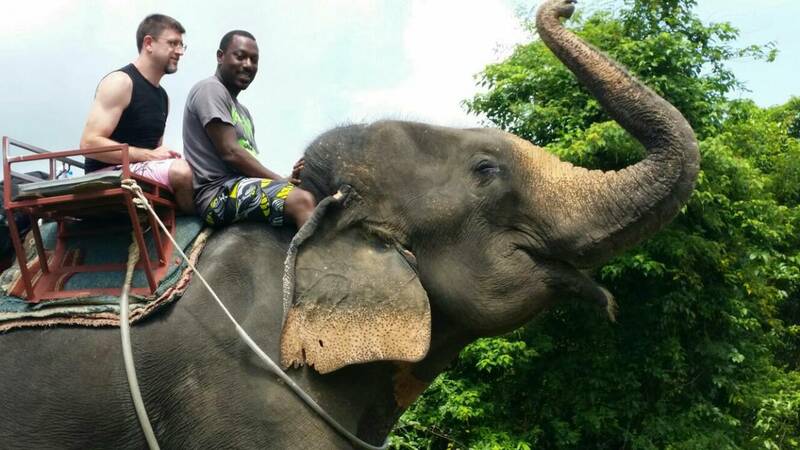 Riding an elephant in the jungle: “Amazing”. Nick’s track did change once, though. While he is in a relationship and remained resolutely faithful despite the obvious temptations, he nevertheless couldn’t fail to notice how appealing the local women are. His verdict on Thai girls: “Stunning”. That one changed adjective aside, the recurring theme was obvious, and proof that the tourism authority’s oft-mocked slogan is accurate. Moaning expats, tap into your inner tourist now and again and remember why you made “Amazing Thailand” your home.